To provide students with tips for resisting peer pressure, this activity includes suggestions on how to say “no” to friends. It complements the “How to Say ‘No'” poster and demonstrates concrete examples of what adolescents might say if pressured to use tobacco. 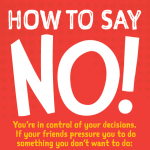 Display the “How to Say ‘No'” poster (included in the “Materials” section). Review the tips with your students. Then, share the digital activity link below. Read the introduction and directions together. Note that students will see the “How to Say ‘No'” poster onscreen and can click to enlarge it in a separate window. Ask students to keep the window open so they can refer back to the poster. Then, ask students to complete the activity independently. While students are completing the activity, list the “Ways to Say ‘No'” on the board or chart paper. How else could you say “no” to friends who might pressure you to smoke or use tobacco? What would you actually say in this situation? Are some ways to say “no” better for certain situations than others? For example, if a friend asked you to lie on his behalf, would you use the same method of saying “no” as you would if a friend asked you to use tobacco?